Skyline station wagon? From the factory? As we all know the beloved R32 Nissan Skyline GT-R is a car that took far too long to cross the Pacific. However despite the long-awaited end of the R32's embargo, we in the West are still living in not-so-blissful ignorance as more JDM gems reside in Japan. The car we’re talking about today is the Nissan Stagea C34, which can be simply described as the station wagon edition of the R33 GT-R. Basically this is the Nissan GT-R for dads. Make no mistake; the association of “station wagon” does not make the Stagea guilty of being uncool. There were several variants of the Stagea, but for today we’re going to look at the ultimate version: the Stagea 260RS Autech. The 260RS was part of the 1996-01 generation of the Stagea. It was the only C34 to come with the RB26DETT engine, a 2.6-liter twin-turbocharged inline-six. The Autech 260RS used the same all-wheel-drive setup and five-speed transmission from the GT-R, but it had a beefier body and drivetrain. It was also a heavyweight, tipping the scales at over 3,500 pounds. It made about 280 horsepower from those two turbos. That’s quite a bit of power for a mid-90s 2.6-liter engine. It also came from the Autech factory with Brembo brakes, BBS wheels and a limited-slip differential. While it is known as the wagon version of the R33, aesthetically the Stagea has its own style, and it stands independent of the R33’s angular and rough box-like exterior. As it was intended to be a direct competitor to the Subaru Legacy Touring Wagon, the 260RS offers gentler edges and while it still is boxy, a trait difficult for a station wagon to avoid, the headlights are curvier around the corners. It certainly doesn’t have an aggressive look like the R33. But it’s still a Skyline underneath that soft teddy bear exterior. Apparently the Stagea modifiable platform as well. A later generation was released after the C34, but it used different engines. Production eventually halted in 2007. 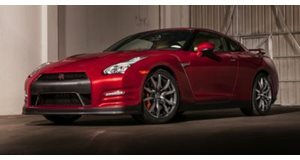 As the years go by we expect this GT-R wagon to become more popular among Americans looking to import the best recently-legal cars from Japan. For now may it rest in peace as the Skyline Wagon, but under it’s own name: the Stagea Autech 260RS.